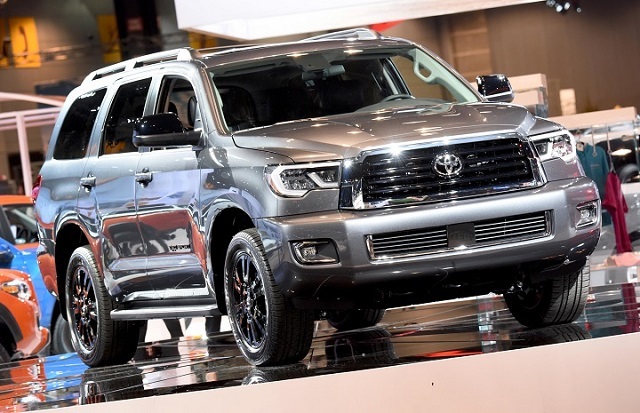 The Japanese manufacturer has given a few upgrades to its well-known full size SUV and now we are about to see the new and improved 2018 Toyota Sequoia. The current generation of this model has been around for almost a decade, so in the growing SUV segment, the Toyota has decided to refresh it in order to stay competitive. What is also new for the 2018 model, is the introduction of the new trim-TRD Sport which has made its world’s premiere at the 2017 Chicago Auto Show. For all those who love off-road driving and adventures, the new Sequoia could be the right choice for you. Besides that, it offers a strong engine under the hood, attractive interior and handsome exterior. So, for the 2018 model year, the Sequoia will feature some small but noticeable changes inside and out, more standard safety features and a new TRD Sport trim which will appear with more aggressive exterior. The new Toyota will compete against Ford Expedition, Dodge Durango, Chevy Tahoe, GMC Yukon and Nissan Armada. 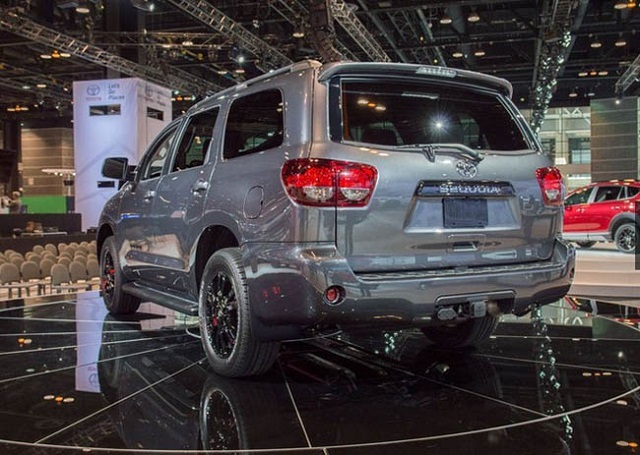 Under the hood of the 2018 Toyota Sequoia, there won’t be any changes. It will continue to use the strong 5.7-liter V-8 unit. This powertrain will be able to make 381 horsepower and 401 pound-feet of torque. It will pair to a six-speed automatic transmission. The new Sequoia will be able to hit 60 mph in less than 7 seconds. The rear-wheel drive will be standard. However, the all-wheel drive configuration will be available too. As for the fuel economy, with FWD it gets 13 mpg in the city, 17 mpg on the highway and 15 combined. With all-wheel drive, it is rated at 13/17/14 mpg in the city/highway/combined drive. Speaking of the exterior design, the 2018 Toyota Sequoia won’t be much different than its predecessor. It will only feature more rounded front and rear fascias. However, the Sequoia TRD Sport will bring some novelties which will include larger 20-inch wheels, black trims and chrome grille surroundings. The standard Sequoia rides on the 18-inch alloy wheels. 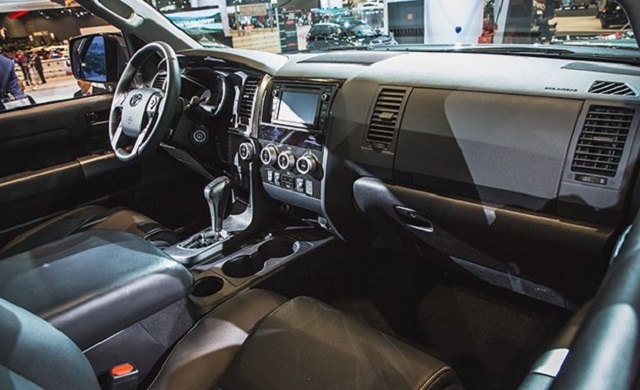 Speaking of the interior design, despite the fact it is a full size SUV, the 2018 Toyota Sequoia doesn’t offer so spacious and comfortable cabin at all. It has three rows of seats but the third row is a bit crowded and isn’t suitable for adults. However, it can fold down for more cargo space. The seats are wide, and the second row can slide if you need more legroom. The dashboard features a 6.1-inch touchscreen with infotainment system. As for the equipment, the new Toyota will come with many standard features. Some of them are: Bluetooth, USB, three-zone climate control, a rearview camera, and power adjustable driver’s seat. Moving to the higher trims, Toyota adds adaptive cruise control, a power liftgate, a rear-seat Blu-ray player and premium audio system. When it comes to the safety, it will be provided with forward collision warning, blind spot monitors, lane departure warning, airbags and so on. The 2018 Toyota Sequoia should arrive this fall. As for the pricing, it is expected to start at around $48,500.